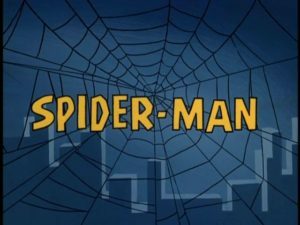 Let’s face it, there is no more famous Spider-Man music than the cartoon theme everybody remembers from the 1960s. (“Is he strong? Listen, bud: he’s got radioactive blood!”) Composer Michael Giacchino, commissioned to score the new Spider-Man: Homecoming film for Marvel/Sony, knew this and decided to replace his own Marvel logo music at the start of the movie with a 38-second version that — as played by a 90-piece orchestra — is probably the biggest sound it’s ever had! I decided to look into this, and interviewed both Giacchino and Guy Webster, the son of the Oscar-winning lyricist who penned those immortal words and who cut the original, very lucrative, business deal for the song in 1967. This entry was posted in Composers, Film Music, Interviews, Television Music and tagged Film Music Society, Marvel music, Michael Giacchino, Paul Francis Webster, Spider-Man cartoon theme, Spider-Man music, Spider-Man: Homecoming on July 11, 2017 by Jon Burlingame.